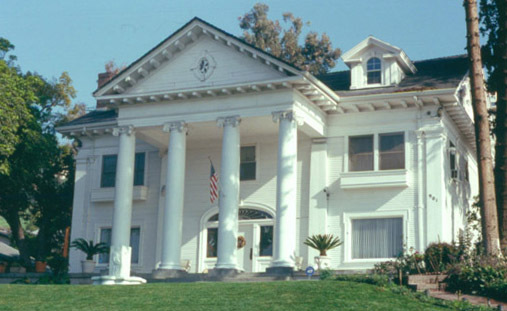 Built in 1905, this Antebellum-style Greek Revival Mansion was designed by John C. Austin for restaurateur Max Nickel. In 1936, the home was sold to Jeung Leong, whose son, Gilbert Leong, was to become the architect of much of new Chinatown after World War II. The Leong Family was to own the home until the 1990s and it is featured in Lisa See’s book “On Gold Mountain”, which deals with the history of her Chinese-American family from her Great Grandfather, Fong See, who came with his Father to work as a herbalist for the Chinese railroad workers in the 1870s. One myth about the house was that it was the home of World Heavyweight Champion, Jim Jeffries, and has been referred to as the “Jeffries House” in a number of historic surveys and publications. In reality, Jeffries lived about a half mile to the East on what is now the site of Nightingale Middle School. The Jeffries Home was demolished for the construction in 1936. Jeffries brother owned a Craftsman house at 751 Cypress Avenue that is listed as Historic Cultural Monument No. 735. It is the last known Jeffries Family structure remaining in Cypress Park.